The griffin in its earlier forms had the head and wings of an eagle and the body of a lion. According to the Illustrated Dictionary of Egyptian Mythology, the “griffin was known in Egypt before 3300 BC and is possibly more ancient still.” It was a symbol of protective power. Another early griffin depiction is a wood-carving (see photo below) found in a Saka-Scythian burial mound of a 2,500 year old warrior’s mummy in the Altai mountains, in an area bordering Mongolia, China and Russia. In the Bronze Ages in Eurasia, the griffin thus appears to have taken a form that sometimes merged with that of the Ouroboros-dragon-serpent eating its own tail and that was seen in the earliest jade depictions of the dragon. 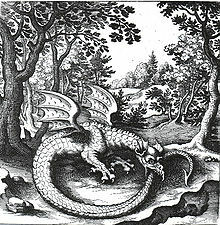 Were both the griffin and serpent-ouroboros images from the Near East the origin of the first griffins and dragons of Eurasia Asia and the East? Out of Egypt, came also the first known ouroboros motif is in the Enigmatic Book of the Netherworld, an ancient Egyptian funerary text in KV62, the tomb of Tutankhamun, in the 14th century BC. “The text concerns the actions of the god Ra and his union with Osiris in the underworld. In an illustration from this text, two serpents, holding their tails in their mouths, coil around the head and feet of an enormous god, who may represent the unified Ra-Osiris. Both serpents are manifestations of the deity Mehen, who in other funerary texts protects Ra in his underworld journey. The whole divine figure represents the beginning and the end of time…. 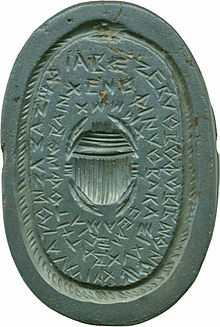 The symbol persisted in Egypt into Roman times, when it frequently appeared on magical talismans, sometimes in combination with other magical emblems. The 4th-century AD Latin commentator Servius was aware of the Egyptian use of the symbol, noting that the image of a snake biting its tail represents the cyclical nature of the year. “–Ouroboros (Wikipedia). Inside the pyramid of Unas in Saqqara, it is written: “A serpent is entwined by a serpent…the male serpent is bitten by the female serpent, the female serpent is bitten by the male serpent, Heaven is enchanted, earth is enchanted, the male behind mankind is enchanted.” There is, however, no illustration to go along with this text. According to Servius, the 4th-century AD Latin commentator, noted the Egyptian use of the image in his note to Aeneid 5.85: “according to the Egyptians, before the invention of the alphabet the year was symbolized by a picture, a serpent biting its own tail, because it recurs on itself” (annus secundum Aegyptios indicabatur ante inventas litteras picto dracone caudam suam mordente, quia in se recurrit), as cited by Danuta Shanzer, A Philosophical and Literary Commentary on Martianus Capella’s De Nuptiis Philologiae et Mercurii Book 1 (University of California Press, 1986), p. 159. This raises an intriguing question whether the use of the dragon (and other animals) in the Chinese zodiac calendar, as well as the origin of the Chinese zodiac system may not have been indigenous. The use of the Chinese zodiac calendar is known from Han Dynasty times, although its lunisolar calendar is said to date from the Shang Dynasty. The animal zodiac system was not unique to the Chinese, but also used by the Mongols, Huns, Bulgars and Turkic peoples, as well as the Vietnamese, Koreans and Japanese ones thought to have been derived from the Chinese ones. The earliest jade dragon was in fact unearthed in the Inner Mongolia Autonomous Region in 1971, is one of the representative works of China’s early jade carving crafts. Above: The earliest dragon carved from jade in China resembles closely an ouroboros Photo: National Museum of Chinese History (source). The Jade Dragon twisted its body to a half circle and is 26 cm in height as a whole. The earliest primitive dragon depictions in China, were adopted as totems, and did not have horns, squamas or feet. However, the extremely early dates as the artefacts date from the Neolithic Hongshan Culture（6000-5000 BC) suggests earliest migrations than the later Bronze Age Scythian dispersals brought such ideas to Eurasia and Inner Mongolia-China. This image of serpent-and serpent-dragon-eating-its-own-tail, in other words, the Ouroboros symbol appears to have become more widespread, dispersing throughout the western world as well as well as eastwards,persisting through the Middle Ages. In the era of Gnosticism, this serpent symbolized eternity and the soul of the world. The Gnostic text Pistis Sophia describes the disc of the sun as a 12-part dragon with his tail in his mouth. In the Middle Ages, the griffin image evolved further forms and adopted various associations and meanings, often incorporated into heraldry and arms, see Monsters and Heraldry – chap XIII of “A Complete Guide to Heraldry” by Arthur Charles Fox-Davies.